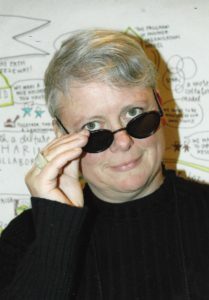 Inga Petri founded Strategic Moves in 2007. Her guiding expertise is complemented by the specialized skill sets of partners in a wide range of disciplines, ensuring that for every assignment the right talent is at the table to generate ideas and produce results. Since 1990, Inga has designed and implemented research and strategies for organizations in the private, not-for-profit and public sectors, employing collaborative approaches that rally participants around common objectives. With experience in diverse sectors – from the performing arts, museums and arts services organization to government, international trade promotion organizations, national membership associations and technology companies – clients benefit from an uncommon breadth of experience and expertise. Inga provides strategic counsel based on solid research and deep insight; she develops brand, web, communications and marketing strategies that effectively reach target audiences; and she delivers tangible results for clients. Inga has a profound record of achievement in the arts and cultural sector spanning from her work in Canadian book publishing during the 1990s to research and strategy projects undertaken for the National Arts Centre, Klondike Institute of Art and Culture, Alianait Arts Festival, Capitol Theatre (Moncton), Storytellers of Canada, Canadian War Museum, Magnetic North Theatre Festival and others during the last decade. Beginning in 2011, Inga has been working across Canada to explore the Value of Presenting: A Study of Performing Arts Presentation in Canada commissioned by the Canadian Arts Presenting Association (CAPACOA). Through this study, published in 2013, Inga has helped deepen the conversation about the role of the presenter within the performing arts ecosystem, in communities and in society at large. She also leveraged evidence from this study in her strategy and marketing practice as well as to shift the conversation on audience development toward audience relevance, and from public engagement in the arts toward public engagement through the arts. Inga co-chairs the Digital Innovation Council for the Performing Arts founded in 2016 under the auspices of CAPACOA. She co-wrote Digitizing the Performing Arts: An Assessment of Opportunities, Issues and Challenges published in April 2017 with funding from Canadian Heritage. Inga is a sought-after speaker at national and regional conferences focused on performing arts and regularly gives talks on the evolving marketing practice and actionable research to a variety of conferences, professional meetings and in post-secondary institutions. In over 80 keynotes, presentations and workshops, Inga has met with more than 4,000 members of the performing arts ecosystem since 2011. She continues to present and workshop on implications of latest insights and expand on their application in the performing arts. We work with a network of independent consultants and respected organizations to complement our internal capacity in areas ranging from field research, web development, writing and organizational development to meet each project’s unique requirements.